Another quintessentially Spanish dish. 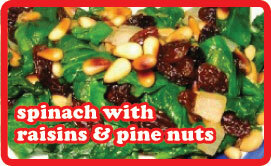 The combination of raisins and pine nuts are perfect. I ate this with a lovely marinated lamb chop done on the BBQ. I think I was born in the wrong country. Spain is calling. Cut off the crusts of the bread and eat them. Cut the bread into cubes. Heat the oil in a frying pan and fry the bread until golden brown on all sides. Remove from the pan and drain on paper towels. Add a little more oil and fry the pine nuts for a minute or so until they are just turning golden brown and nutty in aroma. Add the spinach and garlic and stir quickly until just wilted. Remove from the heat, drain the raisins and stir in along with the bread. Season lightly with salt & pepper before serving. Like I said, I had it with lamb, but I’m sure it’ll work with any old thing.